Japanese Cherry Blossom has got to be my favorite TBS line. Best if you want to: Soften and condition your skin with an intense body moisturizer that lasts up to 24 hours and features a delicate floral scent. 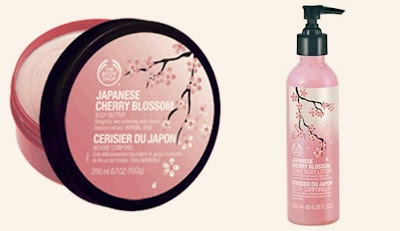 Japanese cherry blossom extract is traditionally renowned for its soothing properties. Community Trade organic soy oil is rich in essential fatty acids that repair skin’s natural barrier, restoring smoothness and suppleness. Community Trade organic olive oil effectively smoothes and softens skin. The body butter is buttery and moisturizing, like any of the other TBS body butters, and smells....well... it almost smells like 'nothing'. You have to really sniff the jar to get the Japanese Cherry Blossom fragrance, and no the fragrance doesn't linger for very long on your skin either. But, I like it anyways. Best if you want to: Delight your skin using a lightweight moisturizer that softens, smoothes and hydrates with the whisper of a sensual floral scent. Community Trade organic olive oil effectively smoothes, softens and conditions skin. Thia lotion is very cooling and thin in consistency. It actually feels like a hand sanitizer. This makes it perfect for summer. 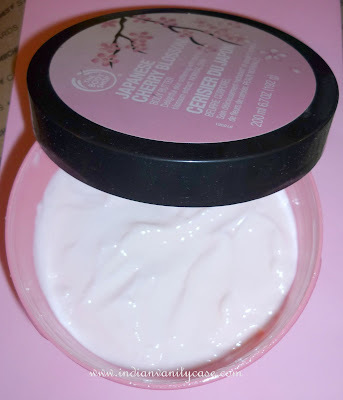 The Japanese Cherry Blossom fragrance is stronger in this than in the body butter. When I apply this, I feel I don't need perfume anymore. Who else love this line by The Body Shop? I haven't used this but I am a sucker for cream or lotion that ha snice fraganrance lke Lakme peach milk, Vaseline Body lotion etc. I am gonna buy it as soon as I'll reach GK-I this weekend. Oooh Cherry Blossoms! I've tried the one at Bath and Body Works and it smells amazing but I haven't tried the Body Shop version yet. Love love love this range.